A-Relief is a portable restroom rental service company that covers the eastern Nebraska, and western Iowa areas, including the Bellevue/Omaha/Council Bluffs area. 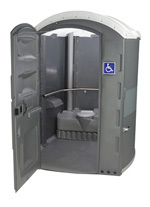 For over years A–Relief Services, Inc has been committed to providing our customers with the best possible portable restroom equipment and services. We′ve invested the time and resources to address the details that you, as our customer, shouldn′t have to worry about. Like our tanks that are 25% larger than most of our competitors′ units – resulting in minimal risk of an "unhappy" experience. Or our formaldehyde–free deodorant that′s friendly to the environment, customers and employees. A-Relief is a portable restroom rental service company that covers the eastern Nebraska, and western Iowa, including the Bellevue/Omaha/Council Bluffs area. A-Relief will provide prompt and reliable service, along with clean and sanitary portable restrooms. Specializing in providing portable restrooms, hand washing stations, holding tanks, camper tanks, hand Sanitizers to special events and construction sites. They say quality is found in the details and at A–Relief, our standard portable restroom has more than enough added features to insure users will be pleased with its amenities and comfort. 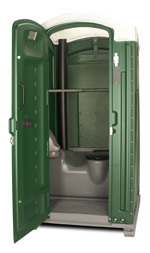 We offer an extra–large capacity restroom with an 80 gallon tank (nearly 25% larger than most of our competitors) designed to handle the rigors of your successful special event or job site. Standard features include: mirror, corner shelves, three–roll toilet paper holder, gender indicator sign and a slip-resistant floor. Another nice feature is the hover handle, which allows users to have a "touchless" bathroom experience. Large 72–gallon tank and ecologically designed sump provides superior performance with less chemical and water use. A–Relief offers the industry′s premier hand washing station. 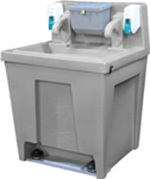 Our hand washing station offers double the hand washing capacity of most standard units on the market. With two molded–in, maintenance–free spigots, two patented high–capacity spray soap dispensers, and a lockable towel dispenser, it′s the perfect choice for large construction sites, festivals, or other highly–attended events. Our hand wash station incorporates hard–sided water tanks, eliminating the need for risky bags or bladders. Molded hand holds on all four sides make the unit a cinch to move and place. And large cutouts make the powerful foot pumps easily accessible, even for users in heavy work boots. DIMENSIONS (Overall): Height: 47.75" Depth: 35.25" Width: 30.25"
A–Relief offers optional hand sanitizers in all portable restrooms for a nominal charge. 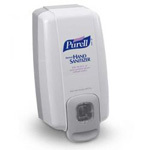 Just as we don′t cut any corners on any of our other products and services, we′re proud to offer Purell – America′s #1 hand sanitizer and the brand most preferred by doctors, professionals and consumers. Contains the powerful and effective instant hand sanitizer that kills 99.99% of germs within 15 seconds without soap or water. Specially formulated with vitamin E and moisturizers to leave hands feeling soft and refreshed without the use of towels or water. This ADA compliant, dermatologist–tested sanitizer is dye free and kills the most common germs that may cause illness. When you′re in charge of organizing a special event, you′ve got plenty of things you have to think about. But one of the things you shouldn′t have to worry about is the performance of your portable restroom company possibly spoiling your celebration. On–Time Delivery and Pickup Need additional/interim services? They′re on–time as well! Home or Office Event? Avoid the hassle and worry of guests tracking in sand or dirt and wandering aimlessly through your home or office in search of the facilities! And the #1 reason A–Relief is preferred for special events? The best employees in the business determined to serve you well providing clean, sanitary portable restrooms! Want more reasons to choose A-Relief Services for your next event? Visit our Testimonials page! For assistance in planning your portable restroom and hand wash station needs for your next special event, call us at 402.291.0220 or email us at SpecialEvents@A–Relief.com! There can be a lot going on at a job site, but one thing that field employees, superintendents, project managers and owners agree on is that when you partner with A–Relief Services on your project, you've got one less thing to worry about. Consistent, reliable service with attention to detail sets A-Relief apart from the competition, and allows you to focus on bringing in your project on time – and on budget in this competitive environment. On–Time Delivery, Service and Pickup Need additional/interim services? They′re on–time as well! Stake–down Service on every project with a tip–over guarantee! Same Say Delivery Guarantee – we know… you need it yesterday… Call us by noon and we′ll have it there by 4 or your first week is free! And the #1 reason A–Relief is preferred for construction? Want more reasons to choose A–Relief Services for your next Project? Visit our Testimonials page! For assistance in planning your portable restroom and hand wash station needs for your next construction project, call us at 402.291.0220 or email us at Construction@A–Relief.com! Please enter your name. Invalid format. Please enter your e-mail address. Invalid format. Please enter your Phone number. Invalid format.